The best romantic restaurants at Walt Disney World involve watching fireworks light up the sky behind Cinderella Castle whilst you enjoy a four course meal at your table. It might also be a modern French restaurant in the ballroom of one of your favorite Disney animated movies or a more formal seafood restaurant placed upon a riverboat on a lake. It could be at a celebrity chef’s restaurant or a steakhouse of a Hall of Fame football coach. It might be a nice French restaurant with tasty souffle’s or a AAA five diamond award winning restaurant where there are no children allowed. This is Orlando Local Guide’s Top 10 Romantic Restaurants at Walt Disney World for Valentine’s Day 2016. Disney World is the top destination for families in the entire world. That is quite a statement when you start to think about it. Stating that, the dilemma for finding a true romantic restaurant with possibly some peace and quiet involves one word – privacy. There are a lot of great restaurants at Disney World with unique ideas and ingredients from all over the world that didn’t make the cut for this list but are still great to visit on a vacation. For the top romantic restaurants, we picked the restaurants that have an eloquent atmosphere with great food that you may not be so inclined to bring the kids. Which brings us to our next dilemma for adults that want to have a nice romantic dinner without the kids. Disney calls them Children’s Activity Centers. We call them babysitters. If you want to have a romantic night out at Disney World, Disney provides guilt-free babysitting in a daycare-type setting at several of the hotels so that you can enjoy a night out or two on your own. Click Here for more information about the Children’s Activity Centers at Walt Disney World. #1. Monsier Paul – Monsieur Paul at Epcot kicks off our list as one of the top 10 romantic restaurants to spend Valentine’s Day at with your date. Whereas Chefs de France is the more noticeable restaurant in France that is loud and noisy, the entrance to Monsieur Paul is tucked away down the alleyway at the France pavilion, on the second level, and provides an eloquent space with great French cuisine that is quiet and much more slow paced. The space for formerly home to another great restaurant by the name of Bistro de Paris. #2. Le Cellier Steakhouse – Le Cellier Steakhouse has a good amount of repeat visitors and reservations need to be made weeks in advance. Le Cellier is located in the Canada section of Epcot and is best known for it’s cheddar cheese soup, soft pretzel bread, and great steaks. Schedule your dinner to have enough time to view the fireworks after your dinner on the lake in the round. Illuminations is the best fireworks show in Orlando. #3. Be Our Guest Restaurant – If you are able to get a reservation, the Be Our Guest Restaurant at the Magic Kingdom is a very romantic setting that will enter you into the world of the Beast’s Castle from the animated movie Beauty and the Beast. 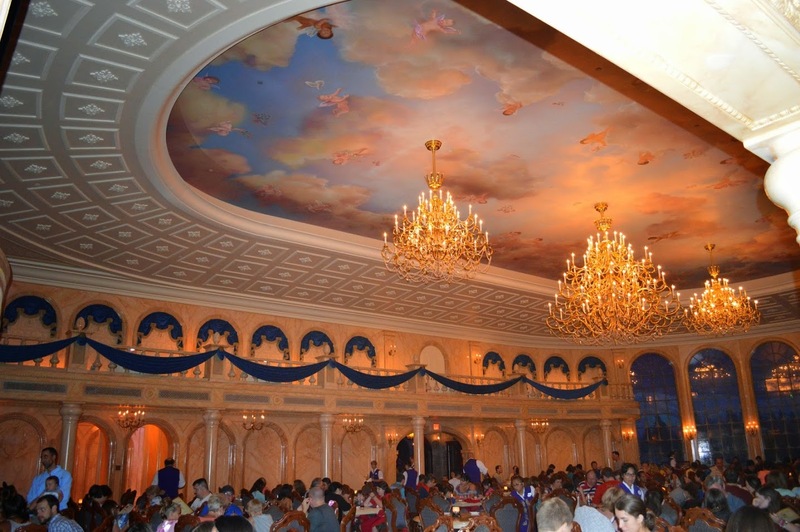 This is the nicest and best-themed restaurant in all of Disney World property and will make your Valentine’s Day a tale as old as time. Start off your meal with the French Onion Soup and choose from between Roasted Lamb or Braised Pork (Coq au Vin Style) for your main course. Plan your night in advance by getting a Fast Pass for the Main Street Electrical Parade later on in evening that also provides a great view for the Celebrate the Magic Castle Light Show and the Wishes Fireworks Show afterwards behind Cinderella Castle. #4. Shula’s Steak House – When the Orlando Visitors Bureau sent 2 winners on a 67 day journey of attractions around Orlando, they listed Shula’s Steak House as their favorite steak house in Orlando. Affiliated with Hall of Fame Miami Dolphins Coach Don Shula, who is still the only NFL coach to ever coach an undefeated team for the entire season, the decor is based on the Dolphins football team but the emphasis is all on the steaks. A signature item on the menu is a 48 ounce porterhouse steak. Fittingly, the restaurant is located at the Dolphin Resort. Before or after dinner, walk across the Swan and Dolphin parking lot across the street to the Fantasia Gardens Miniature Golf Course to play a game of interactive miniature golf (see map below). #5. Todd English’s BlueZoo – Todd English’s BlueZoo is a restaurant concept from celebrity chef Todd English that is also at the Dolphin Resort that focuses on fresh seafood and steaks. Todd English has won several awards from the James Beard Foundation and Bon Appetit and shows off his skills in this ultra-modern restaurant. After dinner, walk over to the Boardwalk to grab a drink or two and enjoy the dueling piano’s at Jellyrolls. #6. Citricos – Citricos is an upscale Mediterranean-style restaurant located at the Grand Floridian Resort and Spa that specializes in fresh and season ingredients. Menu items at Citricos include crispy risotto, braised veal shank, pan-roasted chicken and oak-grilled filet of beef. For dessert, choose from warm chocolate-banana torte or the tropical fruit crème brûlée. #7. Victoria & Albert’s – Where dining meets luxury, Victoria & Albert’s is a 10-year recipient of the AAA Five Diamond award. Everything with your meal is extravagant (see video below) and is setup for a very special occasion, like Valentine’s Day. The premier restaurant at Disney’s premier hotel, Disney’s Grand Floridian Resort and Spa, Victoria & Albert’s prepares a six-course prix fixe meal to be enjoyed. Start off your day before dinner at the Grand Floridian Spa & Health Club with their Grand Romantic Couple’s Massage. #8. Narcoossee’s Grill – Some of the most romantic dinners that you can have at the Walt Disney World Resort involve eating a great meal and watching the Wishes Fireworks Show behind Cinderella Castle at the Magic Kingdom. On the deck of Narcoossee’s Grill at Disney’s Grand Floridian Resort and Spa, they even have the music that is choreographed with the show piped into the restaurant and deck to enjoy with your dinner. Whereas O’Hanas and the California Grill have fireworks viewing on the upper levels of their respective hotels, Narcoossee’s is on the water on the ground level. Narcoossee’s specializes in fresh seafood dishes including Lobster, Scallops, and Surf & Turf. #9. ‘Ohana – ‘Ohana is our second restaurant on the list that allows you to watch the Magic Kingdom fireworks from your dinner table. Located at Disney’s Polynesian Resort, ‘Ohana specializes in Hawaiin and Chinese inspired dishes like lo mein and pot stickers for appetizers, and then skewers of shrimp, pork, beef, and chicken with dipping sauces for the entree. Complete the meal with delicious desserts of Bananas Fosters and Pineapple Bread Pudding. #10. California Grill – California Grill completes the fireworks-at-dinner trifecta with their modern American restaurant on the top floor of the Contemporary Hotel. The California Grill opened at Disney World in 1995 and helped to usher in a new era of restaurants at the resort in which the focus is less on the theme and more on the quality of food. The California Grill is a favorite by locals for special occasions and is one of the best spots for watching the fireworks at the Magic Kingdom as well as the nightly water parade in the Seven Seas Lagoon. The restaurant was closed for Valentine’s Day in 2013 as it went through an extensive renovation. Honorable mention for Valentine’s Day dining goes to Fulton’s Crab House seafood restaurant that focuses it’s attention more on shellfish entrees of lobster, crab legs, crab cakes, and oysters. Fulton’s Crab House has the theme of a converted grand riverboat that is permanently parked at Disney Springs. The restaurant is less modern and has more of a traditional semi-formal feel to it. Grab an ice cream sundae after your meal at the Ghirardelli Soda Fountain and Chocolate Shop and check out a movie at the AMC Theater or go bowling at the Splitsville upscale bowling-alley. After dinner, we recommended seeing Orlando’s best overall show in Cirque du Soleil’s La Nouba for a 6 PM or 9 PM performance. This entry was posted in Restaurants and tagged date night, disney springs, disney world, epcot, february, magic kingdom, valentines day. Bookmark the permalink.